More often than not, you’re targeting readers in the United States – but did you know that email reaches the inboxes of American subscribers only 76% of the time? According to research from Return Path, the United States has the second worst deliverability rate in the world (second only to Brazil). 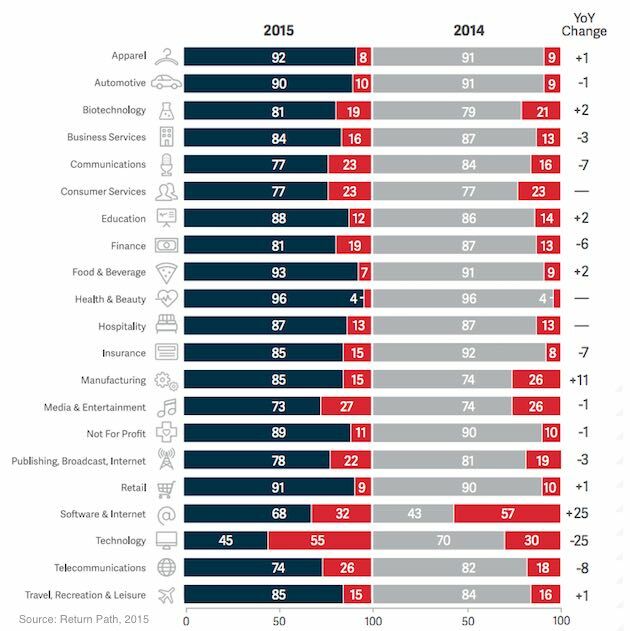 Deliverability also varies greatly by industry (see the graphic below). What does this mean for you? Simple: There’s no better time to create a strategy to improve your email deliverability. To help you figure out what you can do, I put together this two part series of action steps that you can implement today to ensure that your emails are actually reaching your prospects. 1. Don’t shy away from double opt-in. Not only does a double opt-in process comply with the law (like CAN-SPAM); it also helps to lay the framework for a pattern of engagement. Double opt-in also helps deter freebie seekers (people who want what you’re giving away but have no intention of remaining a subscriber), keeping your list’s unsubscribe rate low and overall quality high. 2. Ensure that your “from” field and subject line are explicit and honest. The “from” field should be populated with the name of your brand or [Person at Brand Name]. Your subject line should reflect the actual content of the message (but that doesn’t mean you can’t get creative with it). 3. Segment your list. One of the biggest mistakes made by email marketers is assuming that all subscribers are equal. Measure interest and engagement and segment your list accordingly. A segmentation strategy helps to appropriately nurture your prospects, keep unsubscribe rates low, and improve overall engagement. 4. Utilize the Sender Policy Framework (SPF). SPF offers a higher level of assurance to ISPs that you are who you’re claiming to be, which increases the likelihood that they’ll deliver your message. Your hosting company’s knowledgebase likely contains an article or two on setting up SPF for your domain. 5. Prune your list regularly. Contrary to popular belief, more is not always better. If you have subscribers who haven’t engaged with you after several months, try sending them a special message to encourage a bit of activity. If they don’t bite, take them off your list. 6. Work to prevent hard bounces. This tip is pretty straightforward: if an e-mail bounces, remove it from your list as soon as possible. You can also help to prevent bounced messages by utilizing double opt-in, validating your e-mail collection form, and only acquiring subscribers through legitimate means. Ready for more? Stay tuned for part two! In the meantime, share your thoughts in the comments below!